Beans weren't something my mother prepared very often when I was growing up. She made terrific pasta and meat dishes, but beans were only a sometimes food. When I decided to become a vegetarian in high-school my stomach went into shock due to the sudden increase in bean consumption. Luckily I got used to it and to this day I eat a substantial amount of beans every week. My husband was born and raised in West Virginia and pinto beans were always a stable in his house. When we got married I had to learn to cook with pinto beans since I had only eaten black, white and navy beans previously. Now days we eat pinto beans regularly and my kids love them. This week I tried a new recipe for Pinto Bean Stew with Jalapeno Corn Dumplings from the April 2013 issue of Eating Well magazine. This recipe has 20 ingredients. It takes 9 hours in the slow cooker, 30 minutes of prep and makes 8 servings. I made a few changes to the original recipe. I allowed my beans to soak overnight. The overnight soaking method is the way that I prefer since it takes less active time than quick soaking on the stove. Since I eat gluten free I used brown rice four instead of the all purpose flour called for in the dumpling recipe. For the topping I let off the sliced radishes. My kids do not like them and my local grocery store didn't have them in stock. I let my beans cook on high for 8 hours and then another hour with the dumplings. I always allow my pinto beans to cook for at least this long. Beans in the crock-pot take a will in order to come out soft and flavorful. The dumplings in this stew are the stars of this dish. The stew tasted like any other vegetarian chili and didn't leave a lasting impression. I thought that the pinto beans would be better cooked with a ham hock with the dumplings served on top. Pinto beans cooked in the slow cooker are delicious and the dumplings would work well with them as a topping. My two boys liked the chili (I seeded the jalapeno and used mild chili powder so it wasn't too spicy). They ate their servings and most of the leftovers. For the recipe go to Pinto Bean Stew. That looks great! We love bean dishes and cornbread; these look like nice twists on those. 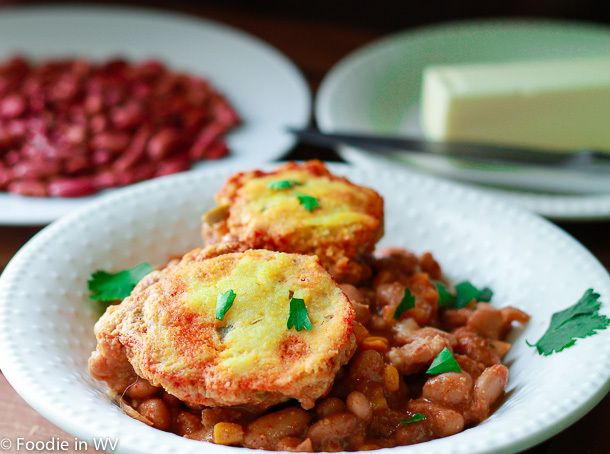 We are big fans of beans and cornbread also :) This recipe is nice since it has a little heat! Oh man does this sound good. And I definitely want to try out those Jalapeno Corn Dumplings - YUM!! The dumplings were the best part, they were yummy! That looks really good. I appreciate the dumplings are GF since my daughter is gluten intolerant. Adding it to my list! I am gluten intolerant also, so I understand :) It can be hard to find recipes that work without gluten. I have a lot of misses when I try converting to gluten free! This recipe worked well though! They add a nice amount of kick to the dumplings, which I like! I love crock pot recipes. I will check back often. Following you from Bloggy Moms on GFC. I love them too :) Hope to see you back soon! Oh my goodness! Now that looks delicious! I found your blog through another ladies blog. Please feel free to check out my blog and follow me back. I love making new Blogger buddies. I look forward to reading more blog posts from you. Now that looks good! So different too. Must have a nice kick with the jalapenos too. Nine hours cook time - whoa! Thanks :) It does have a nice kick from the jalapenos which I like! The nine hours is from the crock pot, which you just sit and forgot, so it isn't bad! Thanks for the sweet comments and the pin :) Come visit again soon!